Thai massage has it’s own story. As with any story, the best one wins. The best story is that Dr. Zhivago created traditional Thai massage while he was the Buddha’s doctor. Along with Buddhism, Thai massage spread into Thailand from nothern India. There the work was preserved by monks who used it to aid their health and facilitate meditation practice. Monks worked on each other to help them with the rigors of sitting and meditating for hours. Then the work was used as a health regimen for those in the villages who went to the monks for healthcare. The sick and infirm would receive the work from monks as the monks worked on their practice of loving kindness and compassion. Thai massage was surely influenced by Chinese medical doctors who passed through the area and also influenced by traditional indigenous medical practices in Thailand. In the end, regardless of the truth of the story the work has been practiced for so long in Thailand that it’s just considered traditional bodywork in its homeland. Over time the work was shared. 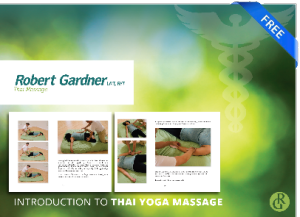 Not until recently has Thai massage been promoted and used in the west. Harald Brust or as he was called, Asokananda, was a German gentleman who learned the work by observing, receiving and asking questions about the work from monks and practitioners in Thailand. Over time he was accepted as a qualified teacher of the work and began teaching it to westerners who wandered through. He helped translate the work into other languages and wrote books on it in addition to classes he taught. My teacher learned from Asokananda amongst others and taught me, so you see the lineage goes back for a long time traditionally but is fairly new to the west. The work is easy to learn, it does take some practice and doesn’t really resemble massage as we think of it in the west. It looks much more like someone doing yoga to someone else, thus it’s commonly being called lazy yoga. Thai Yoga Massage is more of a dance with a client than table work. You’re moving the client and they move with you. The energy lines called sen within traditional Thai massage bear a slight resemblance to meridians in Chinese medicine but there are no points on the line, it’s just a line. For this reason I think of them as being much closer to the experiential lines one feels when you stretch deeply within a yoga pose. The line that goes down the back of the leg and to each toe, the line that extends from the shoulder joint down to the fingertips being the most common examples one would feel. A regular yoga practice benefits the practitioner of Thai Yoga Massage and allows one to work with joints and mobility to understand how to move clients for their benefit. The work you do on yourself will help you understand physical limitations and how to work with them. Thai Yoga Massage is the future of bodywork in the U.S. It’s seed is being planted and in coming years it will grow and produce fruit. It’s far too beneficial to remain Thai in the same way that yoga is now practiced by more Americans than those of Indian descent. Here’s a good video from an American school. Want more? Sign up! Two classes are being offered that you can register for and more will be added over time. You do not need have experience as a massage therapist to take these classes. If you are a licensed therapist in TX I can provide continuing education units through the state. If you wish to sample the work contact me to make an appointment. The most secure way of knowing you want to learn the work from me is to interact, receive what I’ll be teaching and see if it’s the work you’ve been looking for. Yoga and Thai Yoga Massage have arrived in Austin, Round Rock and the vicinity.